This 10,000-square-foot Stouffville, Ontario home - custom-designed by Royal Interior Design - is a carefully crafted blend of beauty, elegance and function. "A lot of people think a beautiful home is not practical or functional for children or everyday living," says Royal Interior Design principal Catherine-Lucie Horber. 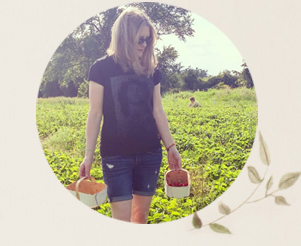 "I always try to find the perfect balance of beauty and function." The basement is a case in point. 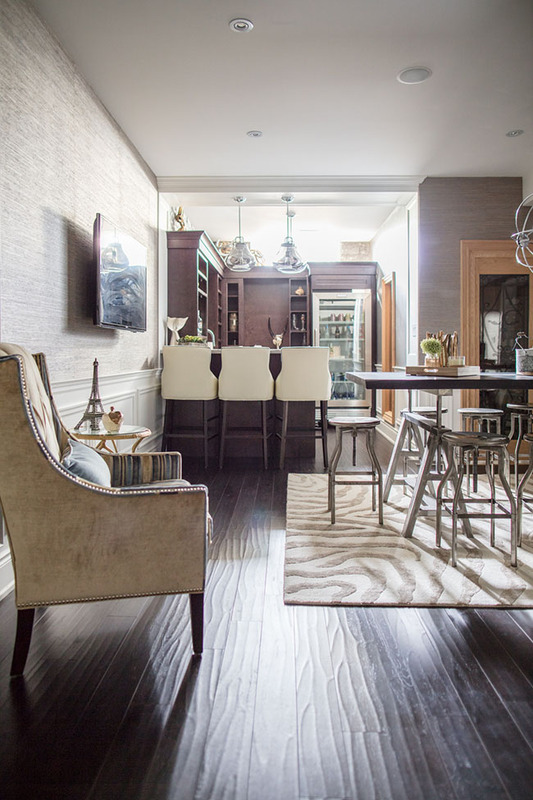 With the abundance of trim work, beautiful finishes, dark flooring, plush furnishings and glam accessories, it has an elegance that could easily translate to a sophisticated condo. 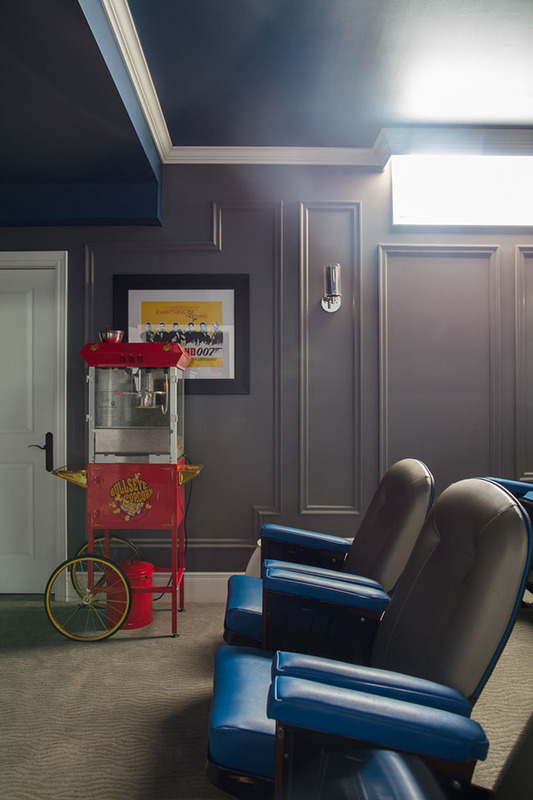 As pretty as it is, this basement is about function and fun too. It's an entertainer's dream - with a bar/kitchen, large dining table, lounge area with fireplace, wine cellar, craft room and movie theatre. Rustic touches like the live-edge dining table (paired with stools that have an industrial feel) keep the basement from feeling too precious. 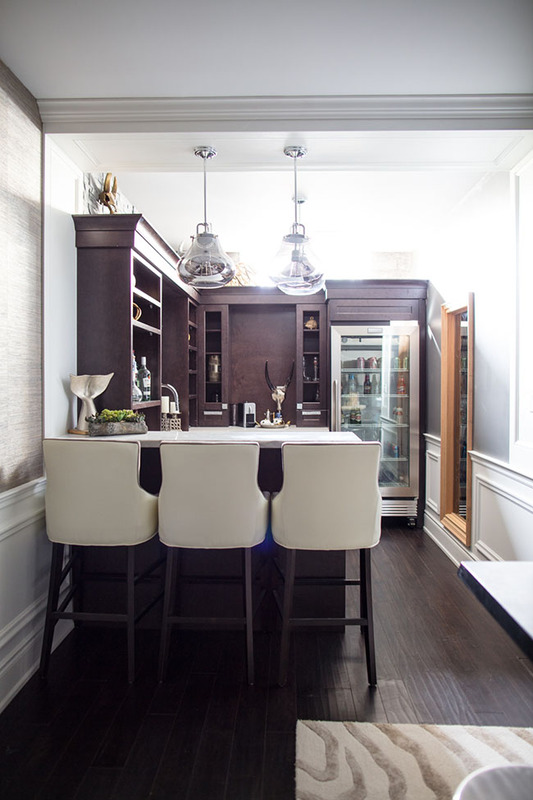 It's easy to imagine hosting friends in this accommodating space - adults grabbing their favourite bottle from the wine cellar while the kids take advantage of a fridge stocked with sparkling water and juices. 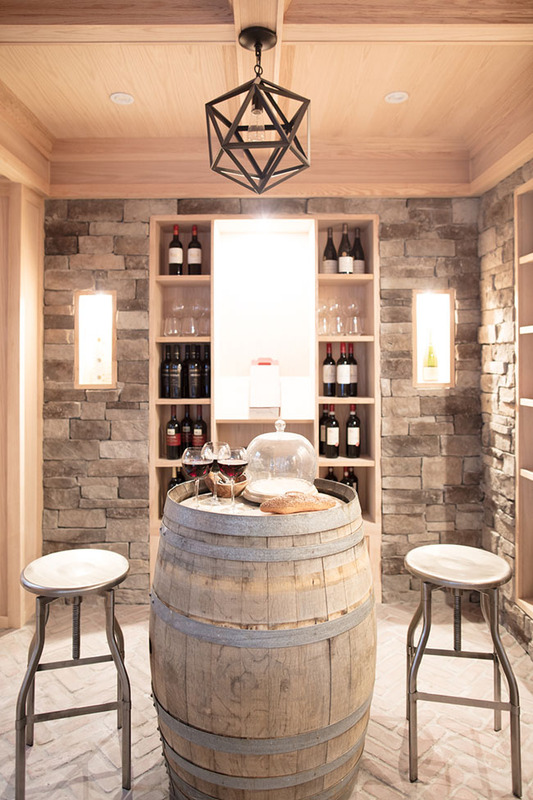 The rustic yet elegant wine cellar boasts a coffered ceiling, brick walls and striking black pendant light. Not to mention that very cool barrel/table. 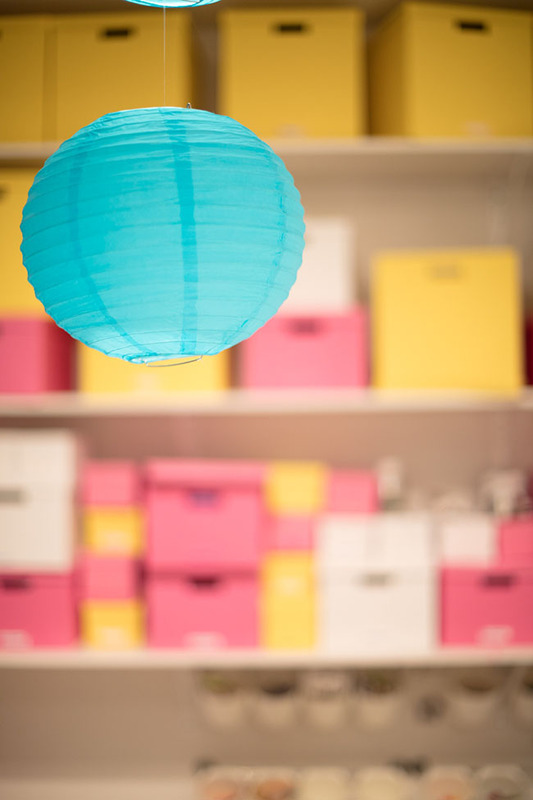 The dedicated crafting and sewing room lends a touch of whimsy to the basement, with a playful colour scheme of pink, teal and yellow. It's a space that begs to be used - the perfect spot to unleash your creativity. 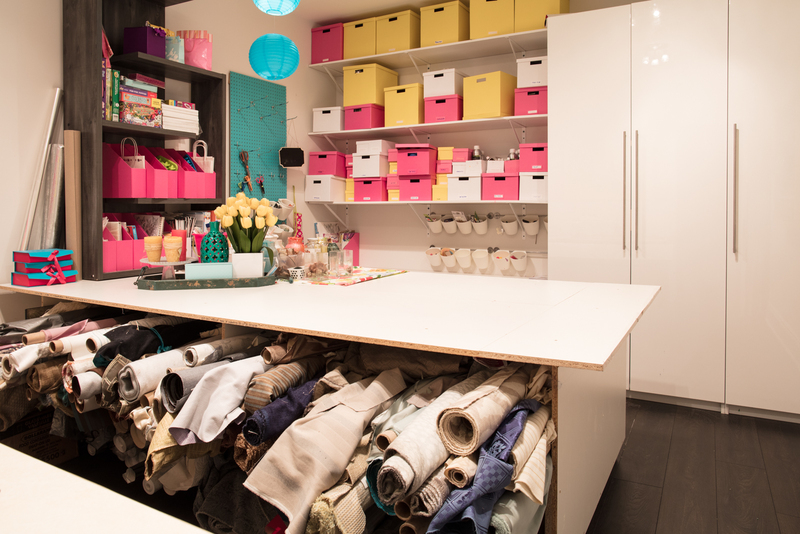 Like the other spaces within the basement, the craft room is also exceedingly practical. 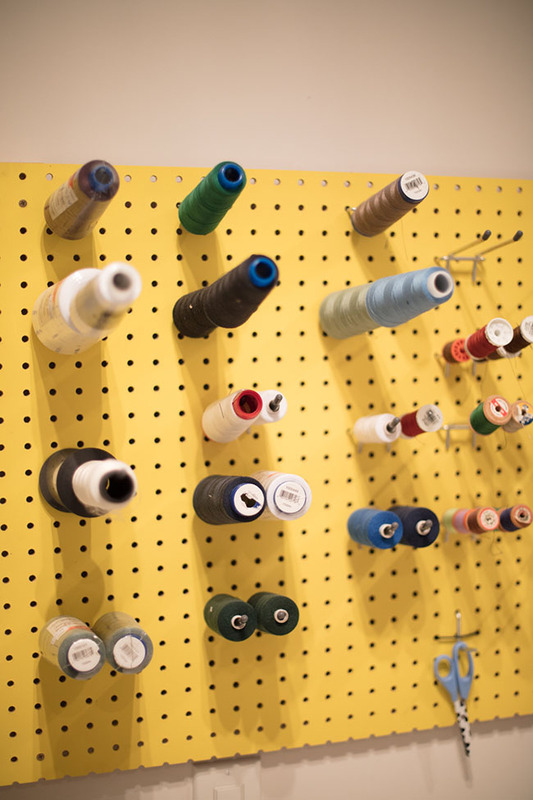 In this case, craft and sewing supplies are contained in colourful storage boxes and mounted on brightly hued pegboards, so they're easy to find without creating clutter. 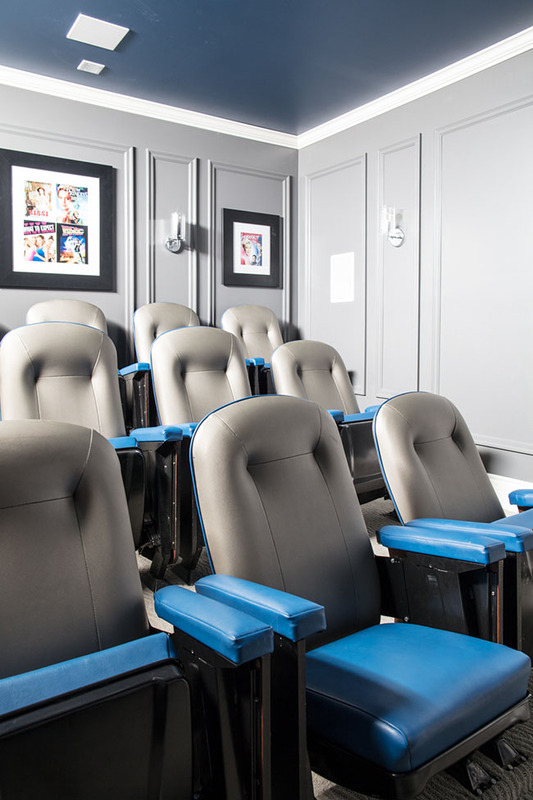 Movie nights are a necessity all year round with this in-home movie theatre. I'm pretty sure this family of four must be fighting off guests. My thanks to Catherine-Lucie for giving us a look at her stunning design! Let me know if you want to see more of this fabulous home. Perhaps a look at the dream closet, complete with skylight? This is STUNNING! 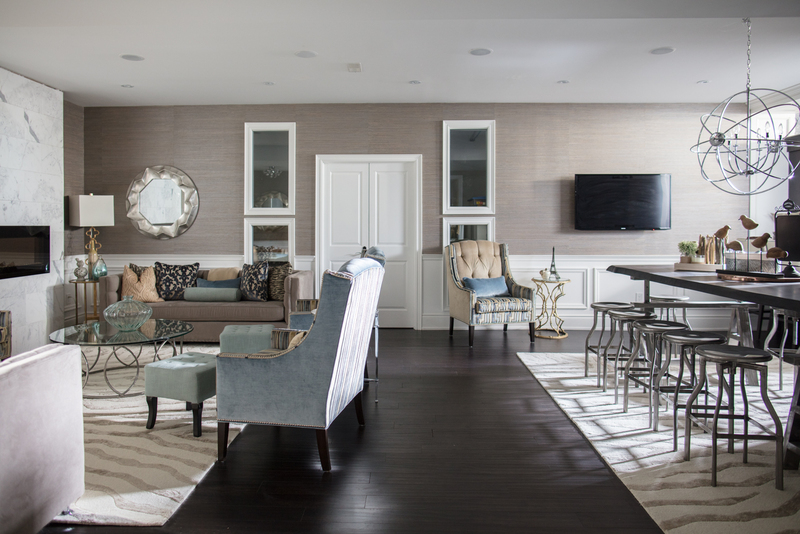 Can't believe it's a basement, it looks so light and airy! So true. That's the lesson I took away - try to make your basement look less like a basement. :) It has me wanting to get to painting my basement! Wow, wow, wow!!! 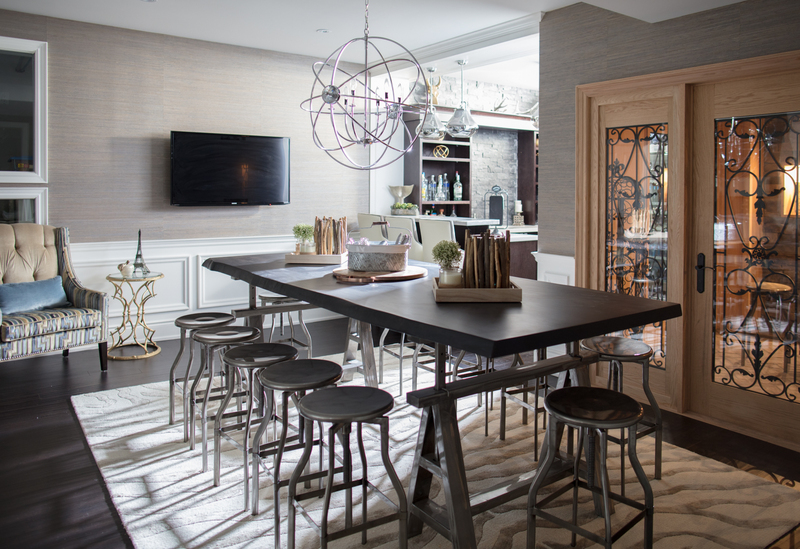 I love that table with the stools. Something we might add to our basement. 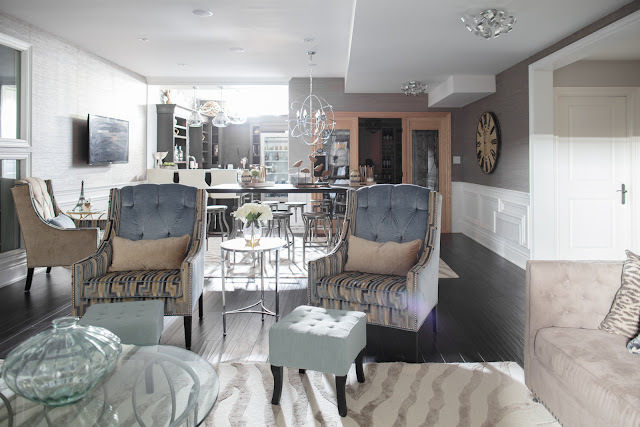 Some fabulous ideas and finishes. Oh wow! 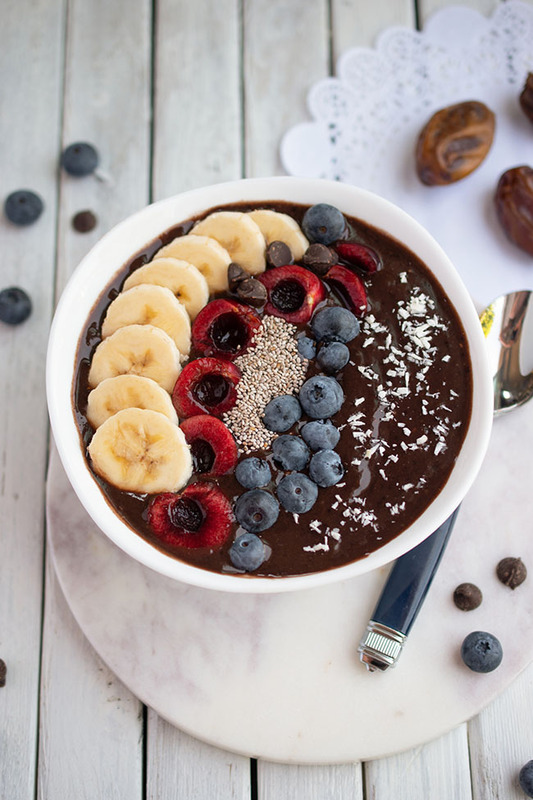 I love everything about this! 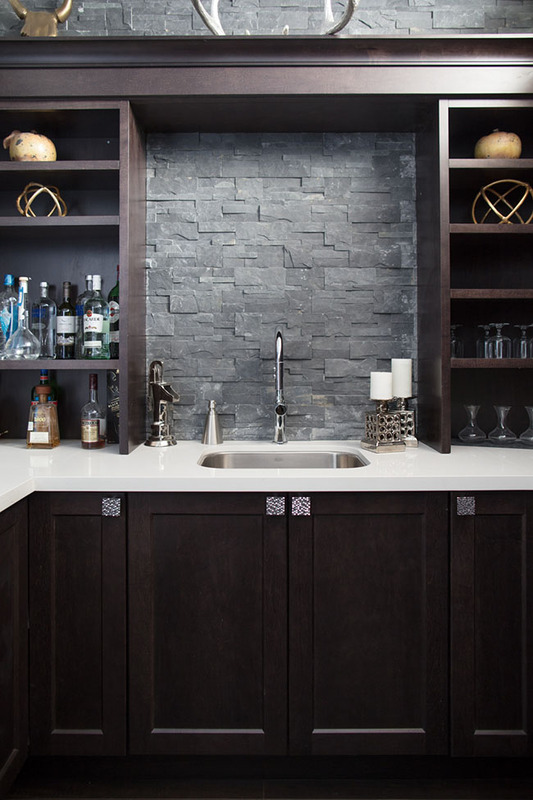 It looks incredible, that dark flooring is just perfect, and the grey backsplash tile is lovely. Oh my,if I only had the funds to do ours.This is beautiful. If only I could get them into our house to do the interior! That would be amazing. Oh so beautiful!! 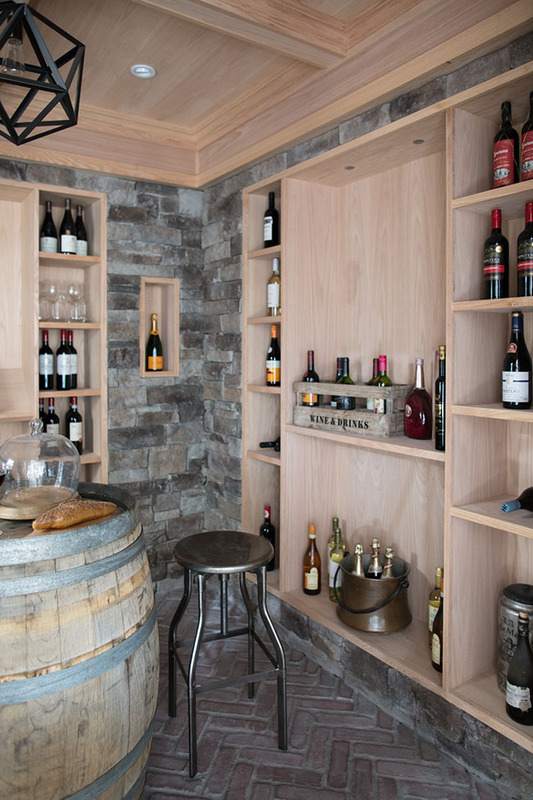 Great ideas for us as we are looking into some basement Renos! I totally love the sewing room and the basement room! Wow! Wow, that's amazing. Hard to believe that is a basement. Lots of spaces for relaxing activities. I like the mix of dark and light colours. Perfect for entertaining, Looks so cozy and comfortable.